When you run races relatively seriously, certain conveniently round finishing times take on a strange importance. You hear runners talking about them, like fishermen talking about the one that got away. Consequently, I spent a substantial amount of effort at the end of last year chasing a sub-40 10k. So, with the Bath Half Marathon just over a month away, and the Paris Marathon edging closer, I suppose it’s only natural that I should start to think about the golden numbers for these distances. Thus far in my running career, I’ve run one half marathon, which gives me a current PB of 1:35:11 based on my chip time. It was a hilly course, and I’d got nowhere near the experience I now have of running long. Consequently, my splits were a little all over the place, ranging from 6:42 to 7:50. The Bath Half is a flat course, and at a cooler time of year. Also, I’ve been running substantially longer distances each week, so it should be a walk in the park. Relatively speaking. So, the question is what time I should target. The obvious golden number for a half marathon is 90 minutes; it’s generally agreed that this is a watershed finishing time for senior men. In a training run, I ran 12.91 miles around Abingdon on Wednesday evening. I’m trying to increase the distance of my faster runs in preparation for the longer races, so set my pace at 7:05-minute miles. 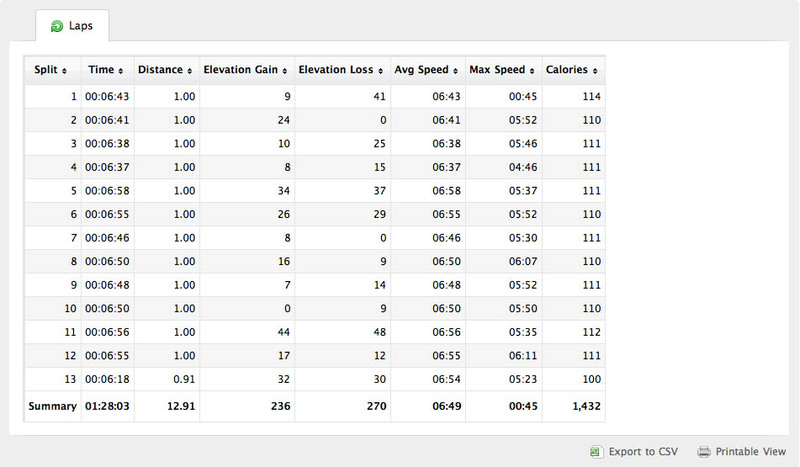 In the event, I ran faster than target pace for the whole run (the summary is below). This run was about 0.2 miles (not far off 400 metres) from half marathon distance, so I was running at sub-90 minute pace. Obviously, running a half marathon is a good indicator of pace for running a full marathon. Many runners choose a build-up race before a main event to perfect their pace and get a feel for controlling their speed in a race. For obvious reasons, you can’t keep up a strong half marathon pace over a marathon, in the same way you won’t be able to run a 10k at your 5k pace.